This simple exercise will strengthen the feet balls and calves, Stand on the toes and walk thus for 15 minutes. To strengthen the knee muscles and ankles, lift a leg on a chair, bending the knee, and then raise the heel of the other leg to bring the heel down. Make 15 repetitions. Curl the toes while standing upright, and try to grab the floor. 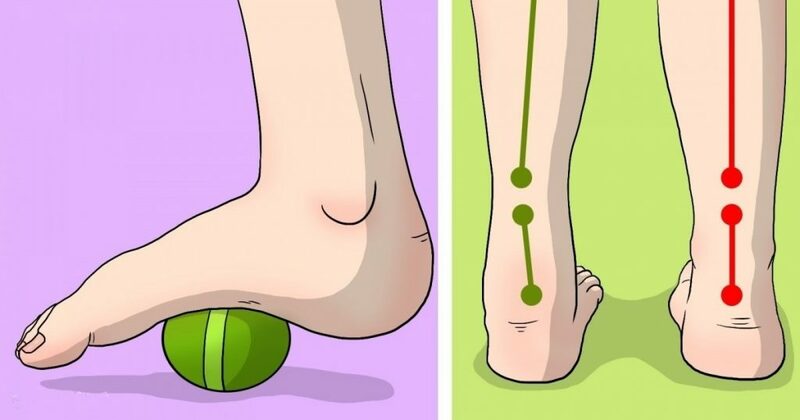 Sit on a chair, put one foot over a tennis ball on the floor, and push it all over the feet for a 10-minute massage. To strengthen the outer thigh muscles and the calves, fix a resistance band around a chair, place one leg underneath the other, and bend the knee. Grab the bend with the toes of the leg on top, and bend backward towards the head. Then, go back to the starting position, and make 15 repetitions. Elevate the foot off the floor, and rotate it at the feet for 10 times inwards and outwards. Repeat for a few times per leg. To relieve hip and knee pain, you should also try foot massage and acupressure. This will relax the feet and the entire body and significantly reduce the pain and discomfort.